On Tuesday evening, August 23, 2016, at approximately 5pm, the Wilmington Public Safety center received a call from Sirius XM security who were actively tracking a 2014 Hyundai Tuscon SUV that had been reported stolen out of Boston. Officers of the Wilmington Police Department were able to locate this vehicle parked on New Hampshire Road. When officers approached, the vehicle sped off, striking the front end of a Wilmington cruiser and then fled a short distance before crashing in the back yard of an Aspen Drive residence. The operator fled and an area search was conducted in the vicinity of Nichols Street in Wilmington and South Street in Tewksbury with the assistance of Tewksbury and Billerica police as well as the State Police and the State Police Airwing. 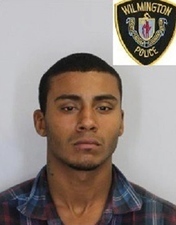 The suspect eluded police until Wednesday morning when the suspect was spotted off of Salem Street in Tewksbury. The suspect again fled from police and an area search was again conducted by Tewksbury Police and their K-9 unit with assistance from Wilmington Police, Billerica Police K-9 units and the Mass State Police Airwing. The suspect was observed and captured by a Tewksbury officer in a wooded area off of Carlton Road in Tewksbury. Mejia is facing charges including Receiving Stolen Motor Vehicle, Assault and Battery on a Police Officer, Assault and Battery with a Dangerous Weapon, Resisting Arrest and Failure to Stop for Police.